Celebrate St. Patrick’s Day with a slice of this indulgent chocolate cake and a pint of Guinness! 1) Preheat the oven to 350°F. Butter a 10” angel food pan and line the bottom of the pan with parchment. 2) In a small saucepan, combine the butter, cocoa powder, and Guinness. Set the pan over medium heat and warm, stirring frequently, until the butter is melted. Remove from heat and let cool for at least 5 minutes. 3) In a large mixing bowl, combine the flour, baking soda, and sugar and mix well. Add the slightly cooled butter, cocoa powder, and Guinness mixture and beat until just combined. Add the eggs, sour cream, and vanilla and beat until the batter is thick and evenly mixed. 4) Pour the cake batter into the prepared angel food pan. Bake until a test skewer inserted into the middle of the cake comes out nearly clean with just some crumbs, or about 45–60 minutes. This cake is meant to be quite moist, so take care not to overbake it. 5) Let the cake cool for 10 minutes. Remove the cake from the pan, rest on a wire rack, and let cool completely before frosting. 1) In a standing mixer fit with the whisk attachment, beat the cream cheese on low-medium speed until smooth, about 2–3 minutes. 2) With the mixer still on, slowly add the powdered sugar to the cream cheese. Continue beating for 2 minutes, then turn off the mixer and scrape down the sides of the bowl. Continue beating the frosting on medium speed until it is completely smooth, another 2–3 minutes. 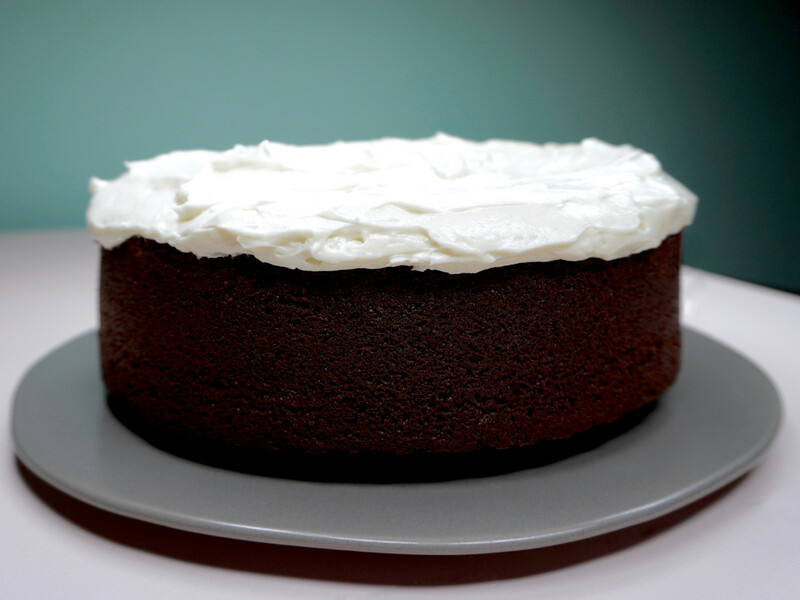 3) Using a rubber spatula, gently fold the whipped cream into the cream cheese frosting until evenly combined. 4) To frost the cooled cake, first place it on a plate or cake stand. Scoop the frosting onto the top of the cake and spread it carefully toward the edges without letting any spill over onto the sides (like the foam on a well-poured pint). Refrigerate until ready to serve. This recipe was adapted from Design Sponge. This entry was posted in Blog and tagged cake, chocolate, chocolate cake, cream cheese frosting, dessert, frosting, Guinness, recipes, St. Patrick's Day.